Let me summarise the plot. 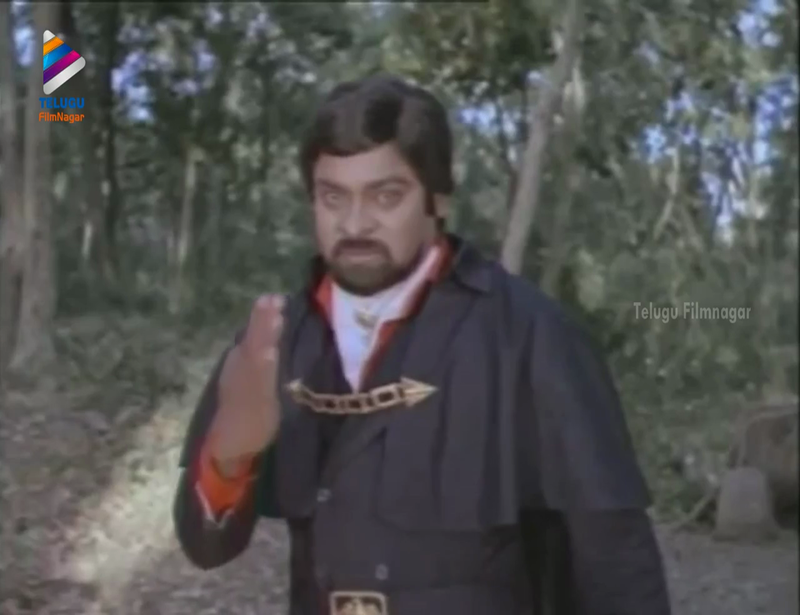 It’s The Chiru of Monte Cristo. A Kodandarami Reddy and the Paruchuri brothers transpose the Dumas classic to a pre-Independence India that still seems somewhat out of time. Maybe it’s all the ruffled shirts. Or lack of credible historical detail. 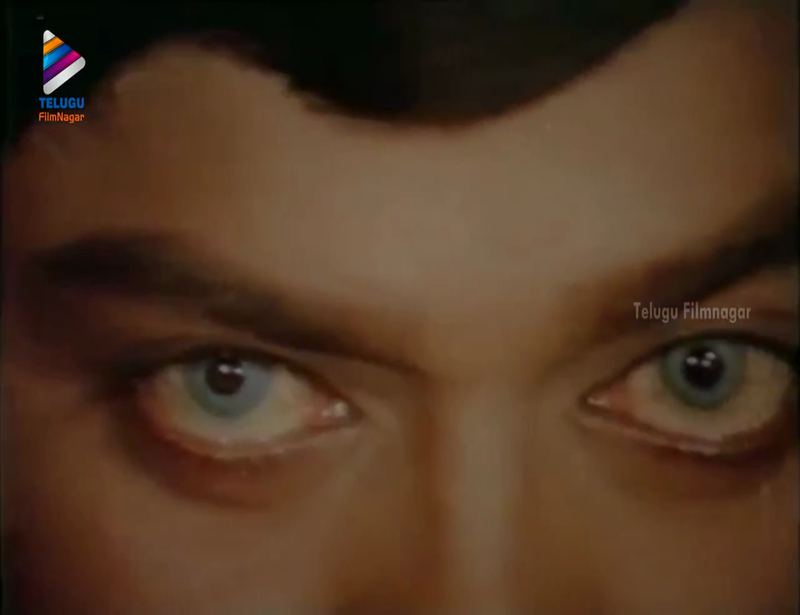 Pratap (Chiranjeevi) is an honest merchant seaman/maître d’, framed and sent to jail merely to protect the self-interest of others. His pre-incarceration outfits tend towards the Purple Rain era Prince influenced. Purple, ruffles, fancy boots, metallic mesh puffy sleeves. OK maybe that last one was purely the wardrobe team. Mahendra Bhoopati (Kongara Jaggaiah) is the king next door, also in jail thanks to sleazy Jairam. 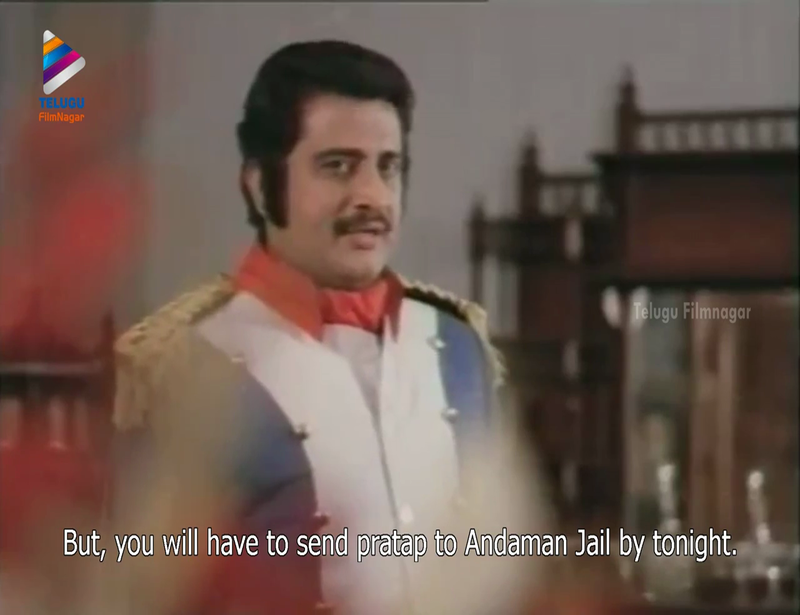 He explains to still innocent Pratap who all had conspired to get him locked up. 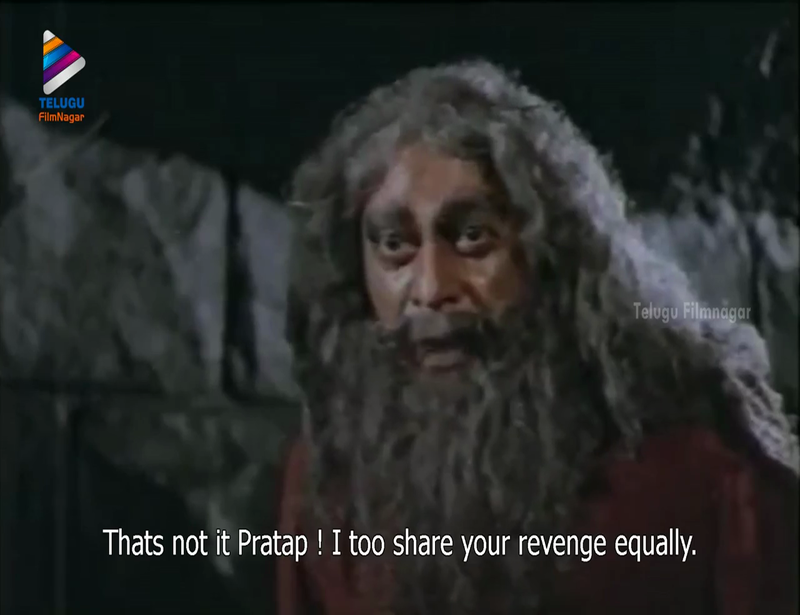 That lights a fire under Pratap and he vows revenge. He also promises to seek out the king’s daughter Jyotirmayi and restore her fortune and title. The map to the treasure is written in blood. Of course. Pratap escapes and is rescued by quasi pirates who take him to the secret island location to find the treasure. There are so many plastic skulls…One pirate is eaten by cannibal tribesmen. But they bite off more than they can chew when they attack Pratap. Yes, I went there! Do note that if you are attacked by cannibals, it pays to have a cobra handy. Many questions occurred to me throughout this episode, and I do not recall the same level of WTFery in the original text. How the hell did Mahendra Bhoopati get that huge trunk into this cave surrounded by all those perils? Did he have the cannibals installed later? 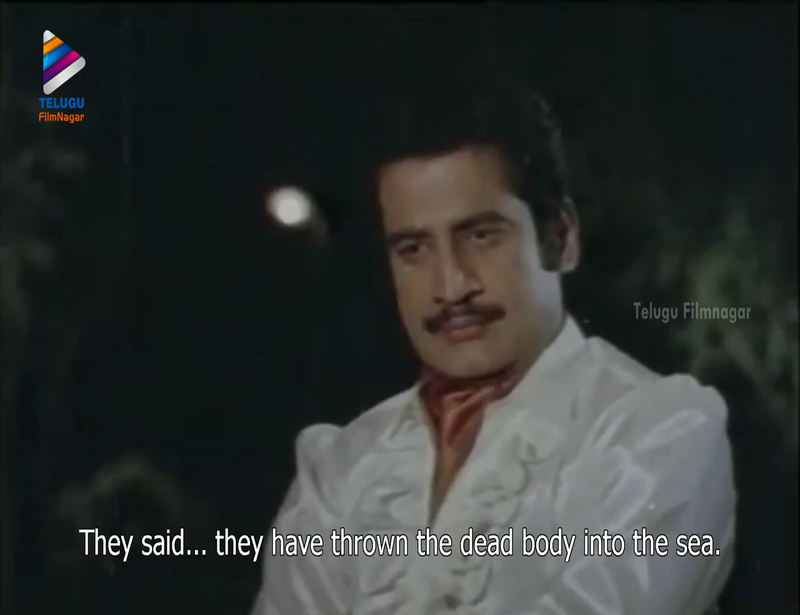 How do Pratap’s clothes stay so white? Pratap returns to civilisation as the mysterious Rana Pratap Kumar Varma. In a vague nod to realism, people do seem to recognise his face even if they talk themselves out of it. 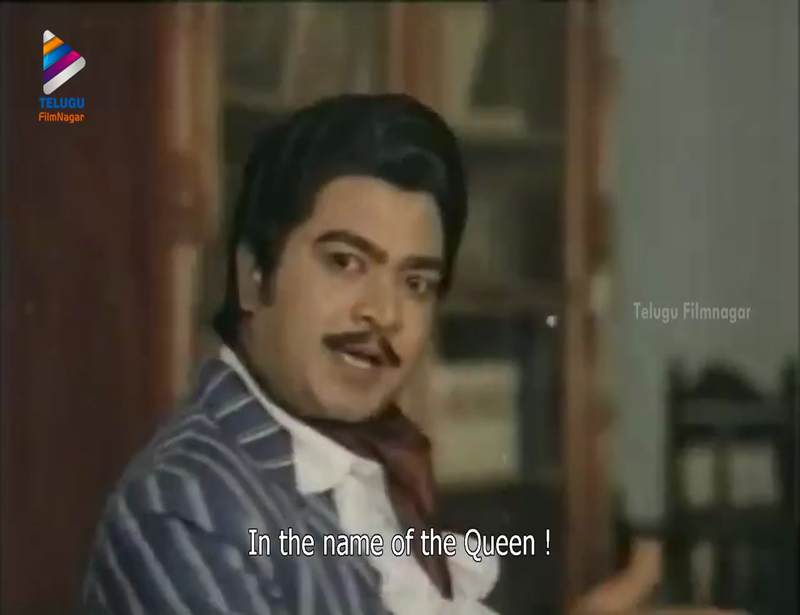 Saroja knows exactly who he is, even without the Significant Ring, but doesn’t tell her husband, the unlovely Jairam. Pratap is enraged at her faithlessness despite knowing she thought he was dead, and his anger makes him really bad at maths. Saroja has a young son and Pratap doesn’t even consider the kid could be his. 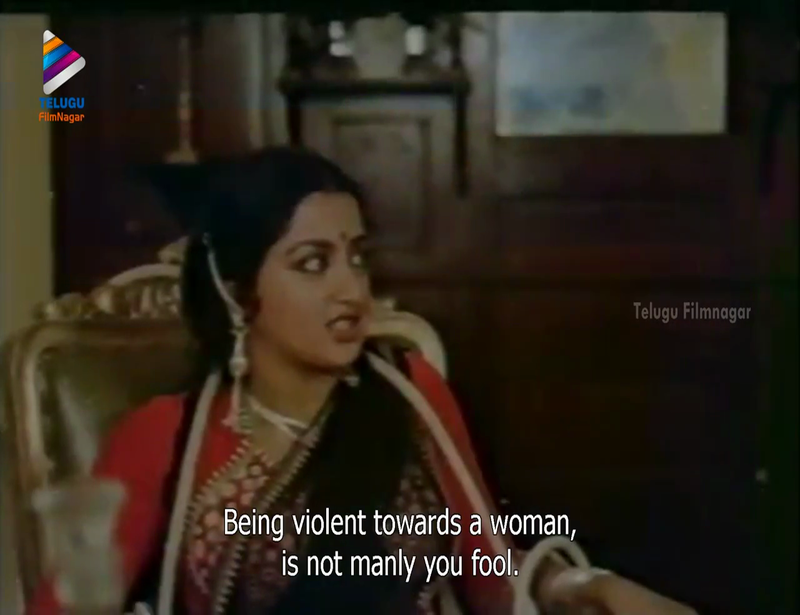 Saroja tells him but he is too far into his rage to believe her. Jyotirmayi (Sumalatha) has feelings for Pratap but she can see he is not emotionally available. That doesn’t stop her from imagining him shaking his moneymaker in a tribal extravaganza. 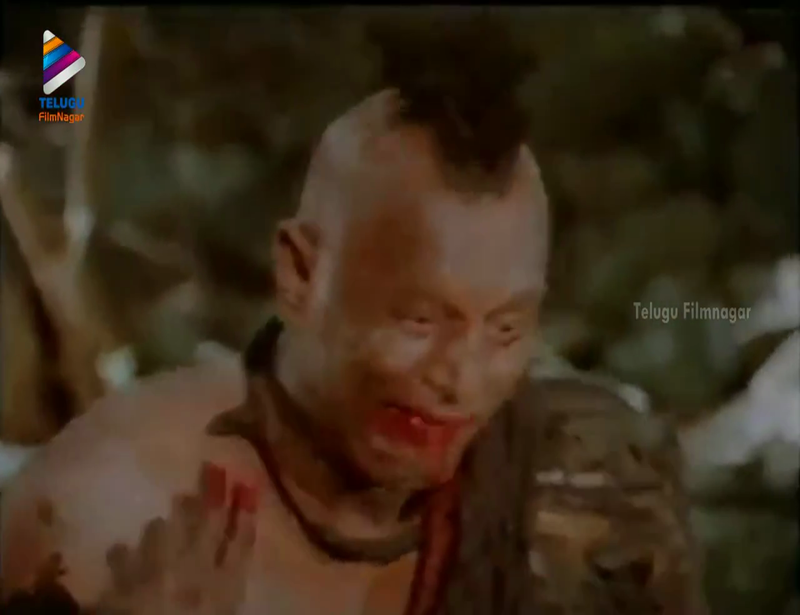 Eventually Pratap goes Rambo and takes his revenge. He is ably supported by the knife throwing Jyotirmayi and hampered by the clueless and obedient Saroja. 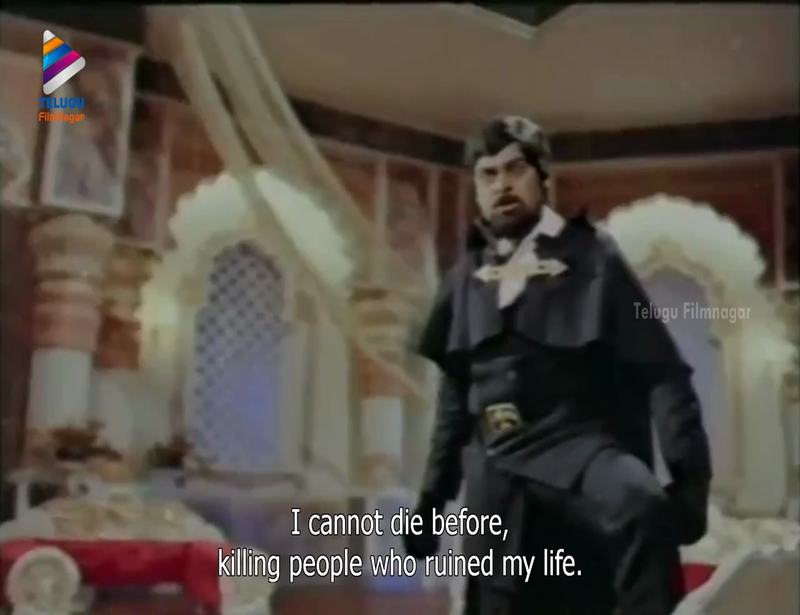 The guns look super fake, Pratap survives being trampled by horses, it is all insane and exactly as expected. 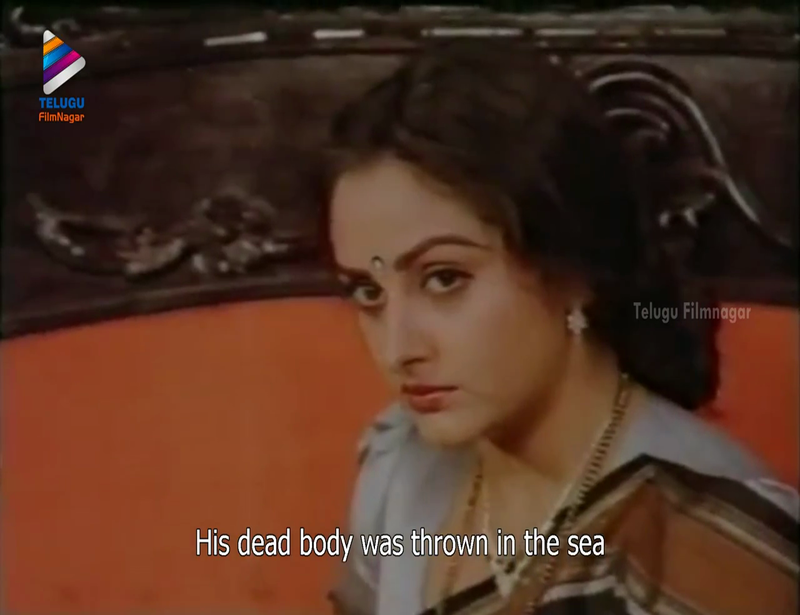 Even Jayaprada’s saree seems to have super protective properties as she did survive a rocket launcher attack unscathed. Once. 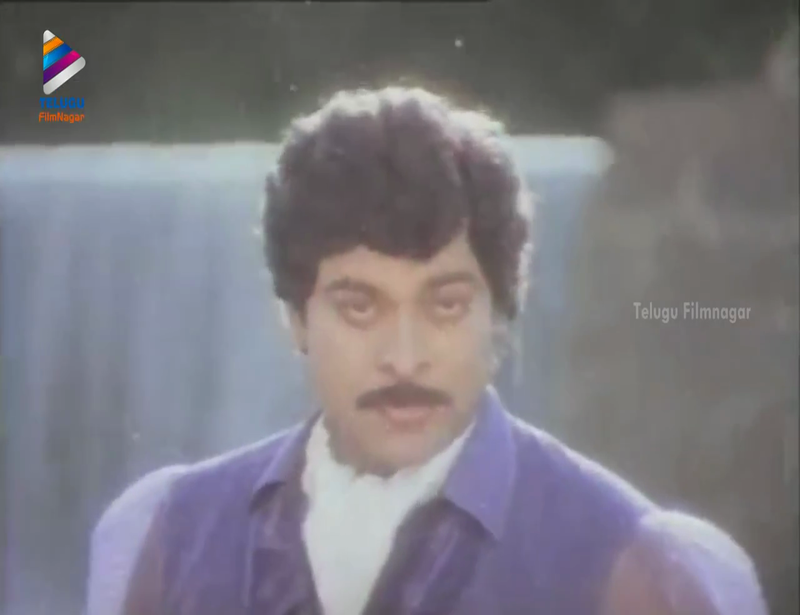 Chiranjeevi is more than up to the requirements of wearing outrageous outfits, chasing horses, prancing mightily, and emoting fiercely. 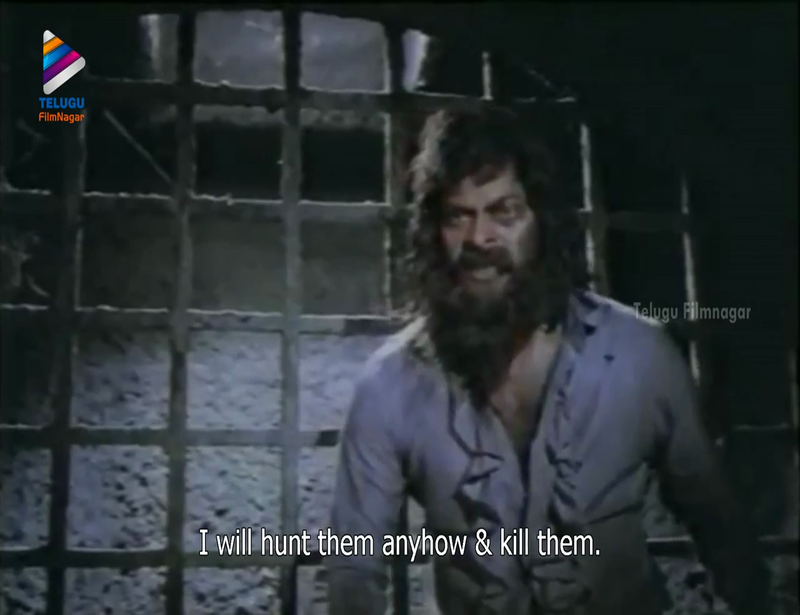 He sounds so sincere in every big speech, and despite the silly trappings he does portray the darker side of Pratap’s character once he is set on revenge. 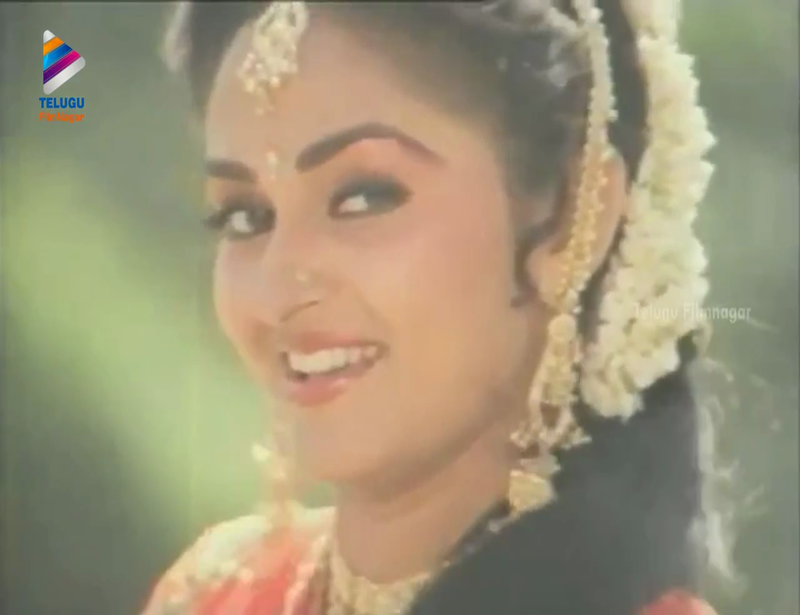 Jayaprada makes a stronger impression in the latter part of the film, when Pratap returns from the dead. She is no longer the demure young girl with horrible fashion sense. She has lived through loss and she knows what her priorities are. 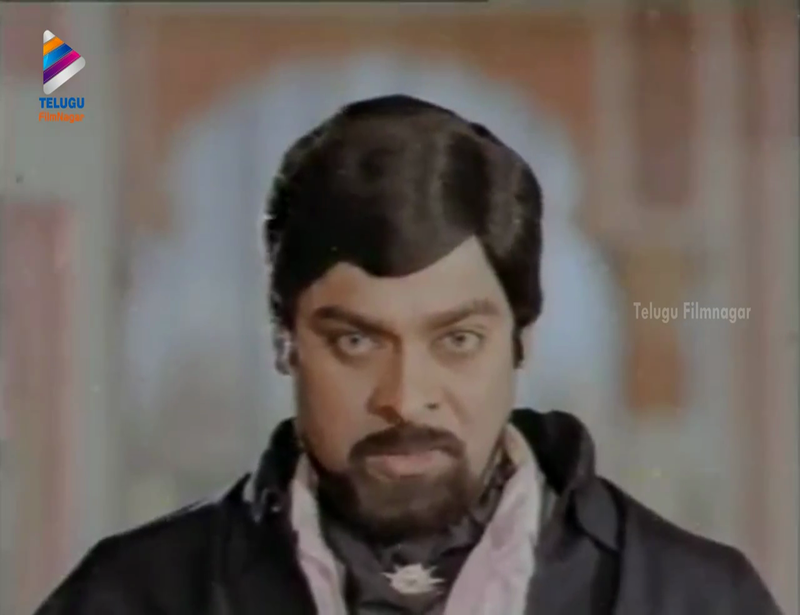 Her scenes with Chiranjeevi crackle with emotion and pain. I am often impressed by how good the good bits of a potboiler can be. Sumalatha is world weary and a bit over it all as Jyotirmayi, and despite minimal dialogue and screen time she makes something of her character. 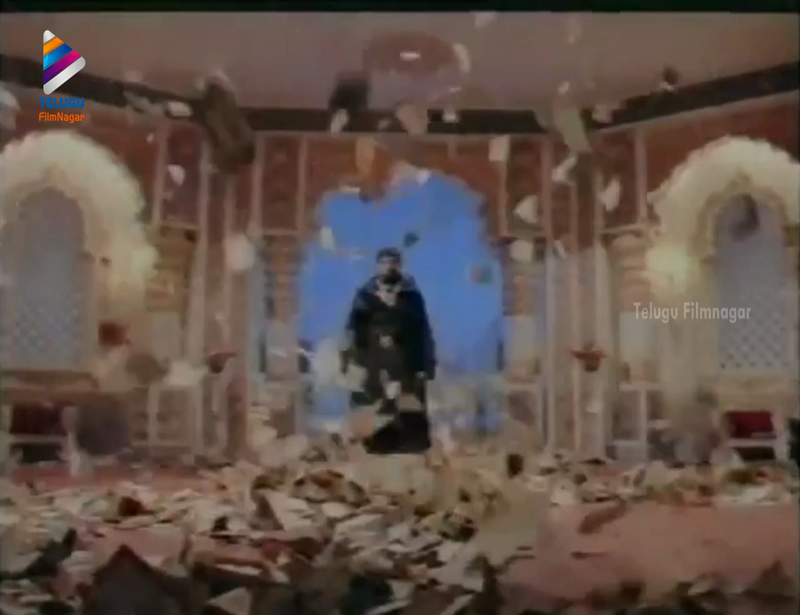 And Jyotirmayi had excellent song costume imagination. The song picturisations range from the usual cavorting on hillsides to more epic fantasies. 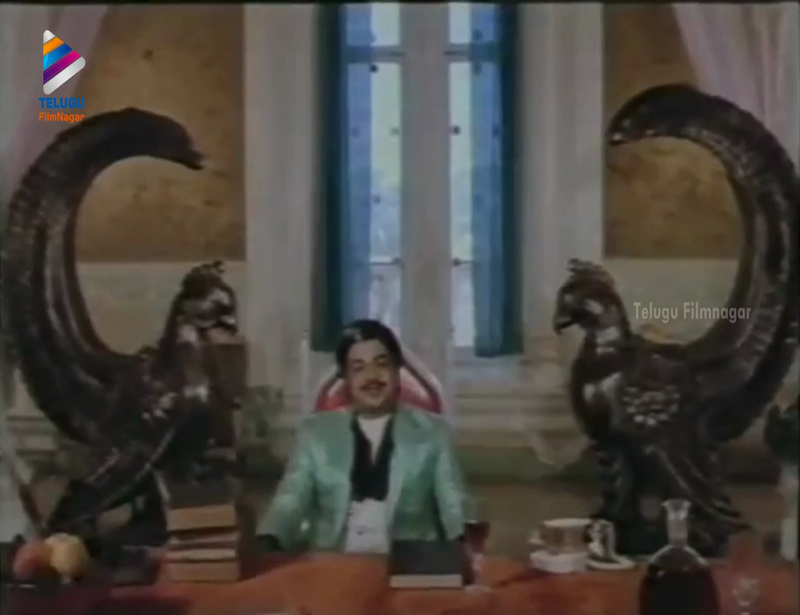 Often the song picturisations are a heroine’s fantasy but in Veta Chiru dresses himself in his songs and his happy memories seem to consist of flinging himself around in ruffled shirts or the mindboggling Fauxgyptian oasis. 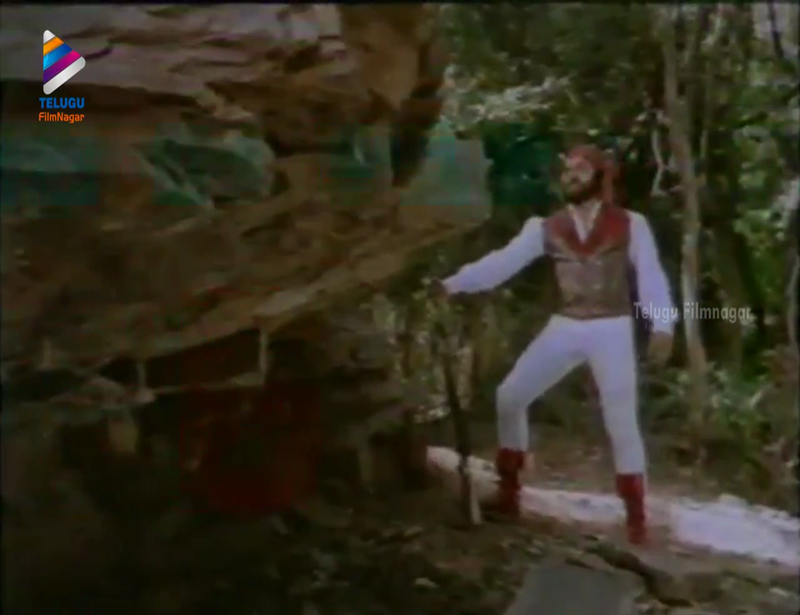 In the Oh Rani song Jayaprada has to frolic in a wet white saree so Chiru frolics in snug white pants. Equality in action. 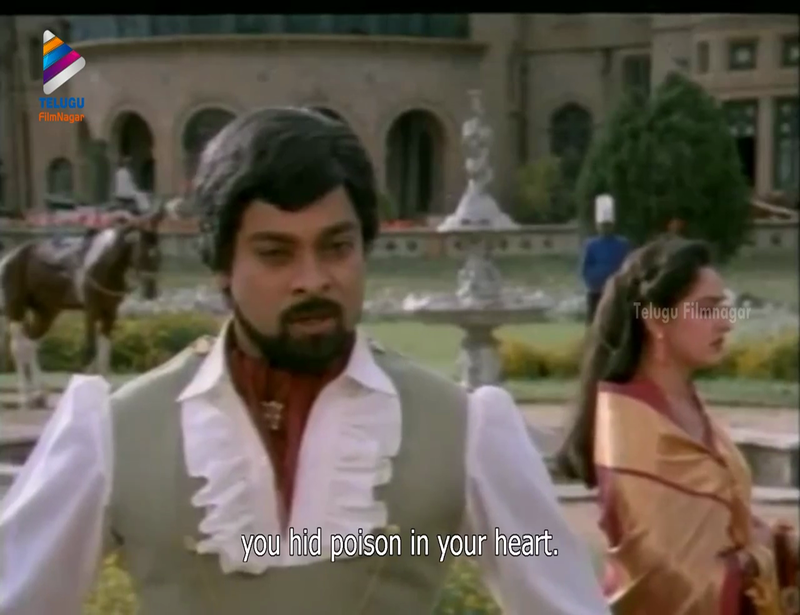 I really didn’t know what to expect from this film other than I’d watch it because of Chiranjeevi. It’s not exactly good but it is highly enjoyable and visually pleasing. 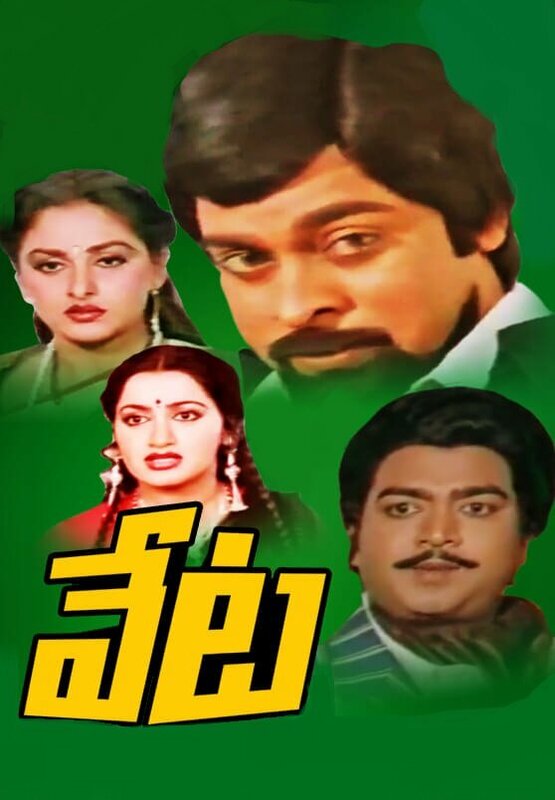 I like both Jayaprada and Sumalatha and their characters do more than just wait and simper, and the Megastar is suitably over the top heroic. I was sitting there thinking to myself that the stunts were unusually human centric with nary an injured horse in sight and then in the last 7 minutes or so the horses started toppling. It’s just so wrenching to watch. See this to round out your education in film adaptations of classic literature, to see a robust sample of ruffled shirts to inform your wardrobe choices, or just because you aren’t sure if I am exaggerating the WTFery or being unusually understated. 3 stars! P.S The film is on Youtube with subtitles. 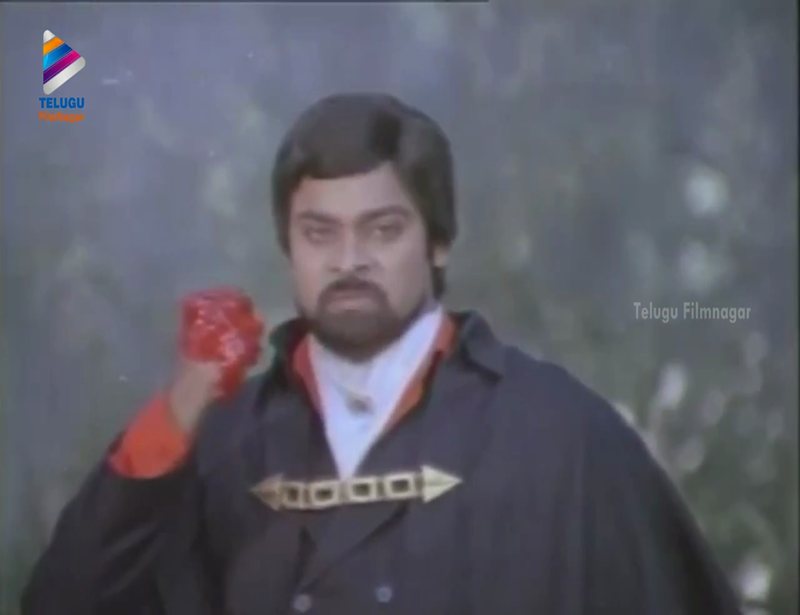 This entry was posted in Tollywood and tagged A. Kodandarami Reddy, Chiranjeevi, Chiru, Jayaprada, Kongara Jaggaiah, mohan sharma, Paruchuri Brothers, Ranganath, Sumalatha, Telugu. Bookmark the permalink.